Equine Chiropractic Series Part 1: What is Equine Chiropractic? From biomechanical restrictions to the disruption of neurological transmissions. With MVS now offering chiropractic services, you may be wondering what, exactly, equine chiropractic entails and how it can help you horse. We’re introducing a new series of blog posts that will cover equine chiropractic in detail, starting today with the basics. Equine chiropractic care is a manual therapy used to maintain health and balance within the musculoskeletal and neuromuscular systems of the horse. It serves as a complementary therapy utilized in the diagnosis and relief of a variety of acute and chronic pain conditions arising from suboptimal function of the spine. Chiropractic work can also be utilized as a prophylactic treatment in performance horses to maintain optimal fitness, or in older horses to regain a higher level of comfort in the pasture. 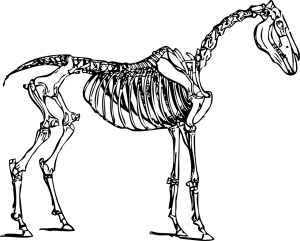 The horse’s spine is a complex framework that has multiple functions including overall structural support, points for muscular attachment, and protection for the spinal cord and internal organs. The spine contains 7 cervical vertebrae, 18 thoracic vertebrae (connected with ribs), 6 lumbar vertebrae, 5 sacral vertebrae (fused to form the sacrum), and 16-18 coccygeal vertebrae. Altogether, there are approximately 200 joints within the horse’s spine that can be critical points to assess during a chiropractic workup. Running amongst these joints are a myriad of nerves that supply the entire body with information vital for routine function and repair. Any impingement on these nerves from a misaligned vertebra can prevent efficient neurological function, potentially resulting in anything from back pain and lameness to impaired reproductive performance and chronic episodes of colic. According to the International Veterinary Chiropractic Association, a Vertebral Subluxation Complex (VSC) is defined as a “functional misalignment of a vertebra or the limited mobility of its facet joint.” More simply, a VSC results in the inability of one of the spinal joints to achieve its full range of motion. From a musculoskeletal perspective, a VSC can cause a horse to lose normal flexibility, and experience stiffness and muscle tension, all of which can adversely affect the performance of the horse. As a result, lameness and the need for chiropractic care often go hand in hand. The correction of a VSC is attained using a high velocity, low force thrust called an adjustment. Correcting the misalignment allows the vertebrae to return to its normal position and serves to restore mobility to the functional motion unit and its surrounding structures. After the adjustment, any prior interference with neurological transmissions are alleviated and the neuromuscular components of the horse are restored to full functionality. During an adjustment, chiropractors will often incorporate muscle work into the session. Functioning under the concept that if the muscles are responsible for keeping the bones in place, when those muscles are tense and tight, they prevent the spine from regaining and retaining a normal alignment. 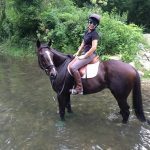 Additionally, when working through sore muscles, horses will often guard themselves, potentially decreasing the efficacy of the adjustment and eliciting a pain response from the horse. In these situations, it is often beneficial to provide massage therapy to certain muscle groups under tension prior to making an adjustment. Why use a Veterinary Chiropractic Practitioner? When choosing a chiropractor to work on your horse, it is highly recommended that you entrust your horse’s care to a chiropractic practitioner that is certified through either the American Veterinary Chiropractic Association or the International Veterinary Chiropractic Association. Additionally, because VSCs and lameness are often intertwined, there are enormous benefits to using a chiropractor who is also a licensed veterinarian. 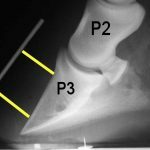 The ability to differentiate between true lameness and chiropractic asymmetry is paramount to attaining optimal equine health. While chiropractors are often referred to exclusively as bone doctors, there are a multitude of complex body systems that a practitioner of chiropractic must fully understand and utilize in order to better understand the needs of the patient. In our next installment, we’ll talk about how to determine if your horse could benefit from an adjustment, certain causes of VSCs, and how to insure your horse’s back remains healthy over the course of his life.